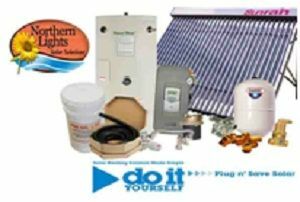 Solar Home Heating or Space Heating is an ideal way to harness the sun’s energy. By using advanced vacuum tube collectors a solar heating system can work in temperatures of minus 40! Our heating systems use a special solar glycol heating fluid that can work in artic temperatures but also with stand high temperatures of up to 480 F. Heat is capture in the collectors and moved to the house through a closed loop system. The heat can then be transfer into the home through radiant floor heating loops, hydronic radiators or through air to water heat exchanges placed in a forced air furnace. 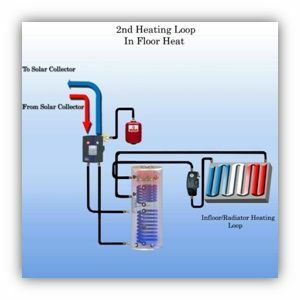 The entire heating loop is controlled by a solar differential controller and a pump. The controller maximizes the systems performance while turning on/off the pump (s) as needed. Most Home Heating applications will also involve an energy storage tank. This is a high insulated tank that is capable of storing the heat for days until it is needed. Most homes in Canada and Northern USA will require more heat energy at night when there is no sun. The sun’s energy is stored through the day in the storage tank for future use. 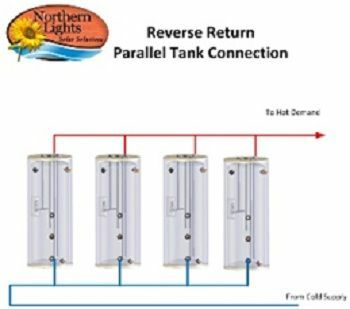 A storage tank is the same as a battery in a solar PV system. Dual Zones - Space heating works best when combined with a second zone such as domestic hot water or a pool or hot tub in the summer. In this way you can use the solar energy in the summer and winter. If a summer zone is not available then the system will have to be covered in the summer to shut it off. Special custom covers can be purchased. The solar storage tank also acts as the domestic hot water supply to the house. Excess energy is pumped through hydraulic radiators or PEX tubing in concrete floors. 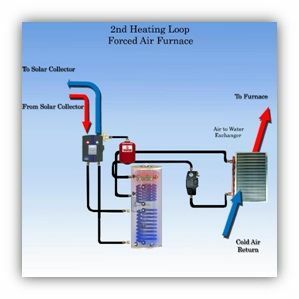 Solar storage tank is integrated with a heater located in the furnace the hot heating fluid’s energy is transferred to the air through an air to water heat exchanger or a Hot Water Fan Heater such as a Modine. collector for every 400 square feet.